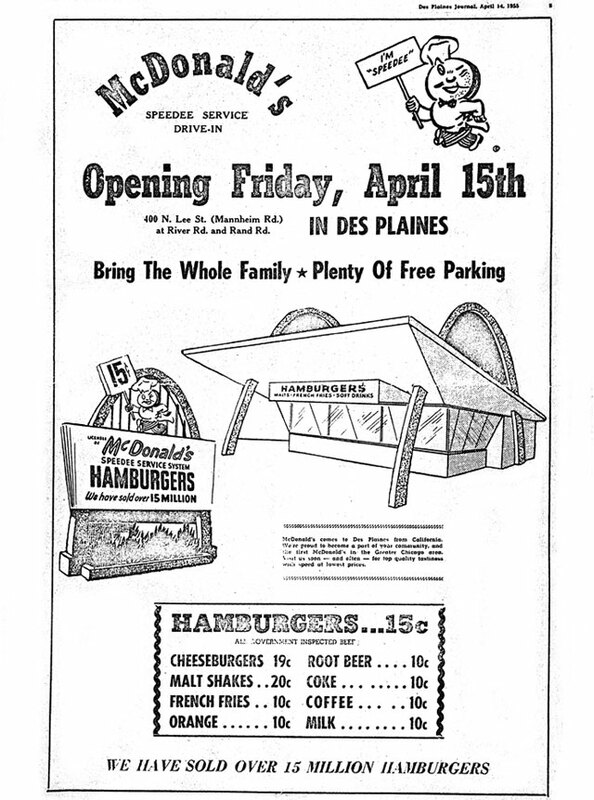 McDonald's Day takes place on the anniversary of the day in 1955 when Ray Kroc opened a McDonald's in Des Plaines, Illinois. This was the first restaurant of his franchise, but the ninth McDonald's restaurant overall. Kroc helped make McDonald's the most known fast food restaurant in the world, but the story doesn't start with him. Brothers Richard and Maurice McDonald opened a barbeque restaurant in 1940 in San Bernardino, California. In 1948, they changed up their restaurant and introduced the "Speedee Service System." Instead of having waiters bring food to tables, their restaurant had self-service counters. They used an assembly line format in the kitchen. Prepared food was wrapped and placed under heat lamps. They also simplified their menu to include only hamburgers, cheeseburgers, french fries, potato chips, sodas, milkshakes, and apple pies. All of these changes helped make food preparation and service quick and efficient, and kept their prices lower than competing diners. They sold their hamburgers for just 15 cents apiece. Ray Kroc was a salesman who had sold malt and shake mixers to the McDonald brothers. He stopped at one of their locations in 1954 and convinced them to let him open a franchise for them, which he did on today's date in 1955. At that time, Richard and Maurice McDonald claimed they had already served 15 million hamburgers over the previous seven years. In 1961, Kroc bought out of the McDonald brothers for 2.7 million dollars. By 1970 there were 1,000 McDonald's restaurants, and by 1988 there were 10,000. By 2017 there were more than 37,000. Over the years, McDonald's has expanded to other countries, while also expanding their menu. They set up shop in Canada in 1967, and are now in over 120 countries. Their menu is often reflective of local tastes. For example, poutine is on the menu in Canada, and the McLobster sandwich is sometimes available in the New England area. Hamburgers and fries have remained a staple at McDonald's, but there are many other foods that can be found at most McDonald's as well. The Filet-O-Fish was created by a Cincinnati franchise owner in 1962 so that Catholic customers had something to eat during Lent. The Big Mac was created by a Pittsburgh franchise owner who wanted a sandwich geared for adults. He used ingredients that were already available at the restaurant. It debuted nationwide in 1968. The Egg McMuffin debuted in 1973, and Chicken McNuggets came out across the country in 1983. Ronald McDonald has been the face of the restaurant since 1963, and for a time other characters of McDonaldland, such as Grimace and the Hamburglar, were part of the company's marketing strategy as well. Happy Meals were introduced in 1979, in which a toy is included with a child's meal. Yellow arches adorned the rooftops of early locations, but "M's" started appearing outside of the restaurant in 1962, and have since been its most popular symbol. McDonald's has been criticized for its role in spreading obesity, although in recent years it began adding healthy items and getting rid of trans fats. It also discontinued its "supersized" portions offering. The company has also been criticized for paying its workers low wages. On the other hand, the company has been praised for its charitable work. The Ronald McDonald House was founded in 1974. It gives families of children in hospitals a place to stay. Today there are more than 360 Ronald McDonald Houses. The Ronald McDonald House Charities was founded in 1987 and has been involved in various charitable efforts that are focused on children. McDonald's Day is observed next on Wednesday, April 15th, 2020. It has always been observed annually on April 15th. Celebrate the day by eating at a McDonald's! You could visit the spot where Ray Kroc opened his first McDonald's in 1955. The restaurant was demolished in the 1980s and rebuilt as a museum. Sadly, the museum has since been demolished as well. There is a McDonald's across the street you could eat at though! The first restaurant the McDonald's brothers had, located in San Bernardino, has long since been closed. You could still visit the location, though, as there is a museum there, and part of the original McDonald's sign remains. The oldest McDonald's still in operation has been serving burgers since 1953 and can be visited in Downey, California. You could also watch Super Size Me, or The Founder, a biopic about Ray Kroc.